In one of the increasingly un-secretish and badly-kept secrets that Apple used to be so good at, the world’s internet media has been double guessing what Apple’s “Media Event” on 27 January (our Thursday 28th) will be unveiling. Yes, I know, we’re a Wellington architecture and urban design blog, but who doesn’t like a juicy fresh apple? And besides, sometimes you just want to break out a little. I enjoy a good Steve Jobs unveiling – he has recently won the CEO of the Decade award, on a salary of just $1 a year – plus healthy stock options (if only we could get corporate banker CEOs to accept that line) taking Apple from a so-called basket case in the 90s to its pre-eminent position as the leading design brand in the world, and the leading stock to buy over the last decade: he’s a leader who knows where and what he’s doing. I’m still at a loss as to why the rest of the world keeps buying non-apple products: or why the computer bods at work make us use PCs. But there is certainly some excitement amongst the mac fan-boys at the prospect of what is coming next. A post on the influential Macrumors website on the last day of 2009 has racked up an incredible 1200+ comments on what exactly the exciting new release may be. 1200 comments! That’s almost a year’s worth of comments for us here at the Fish…. but the curious thing is that they’re all just guesses. Incredibly well-informed guesses mind you. But guesses just the same: Apple keep their staff’s lips well sealed. For your delectation, I include some of the current guesses at the end of the post. But first, a re-cap. Once upon a time Apple just made computers, and computer accessories like printers. Since 1984 with the birth of the Macintosh (a type of apple), the company has arguably led the world ever since, being always a step or two ahead of the behemoth of Redmond. “Start your photocopiers” indeed, as Apple once cheekily trumpeted to Microsoft. Jobs was removed from the company and then was returned, and it has gone from strength to strength since then. You know all this, don’t you? But then, it changed. 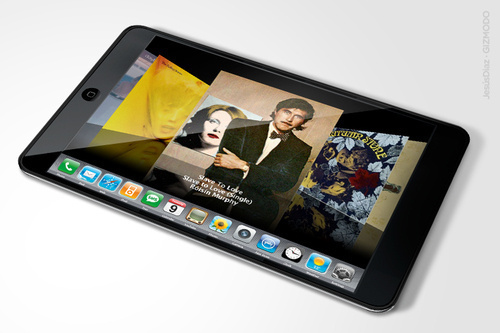 Apple moved their computing power and design prowess into the field of music and entertainment. And since then, Apple has gone on to sell millions and millions of iPods, and the world has essentially changed the way we view movies and listen to music. And nerds and dweebs like WeezerX80 have descended into well-deserved obscurity. Just as the iPod changed the way we listen, the iPhone changed the way we talk, the (rumoured title: iSlate) new tablet computer will, I’m willing to bet, change the way we work. Well, I sure hope so any way. I’m picking the demise of the mouse, and the demise of the keyboard too, before too long. A touch screen, draw on screen, recognise your voice and write it down on screen type of thing, a wave-your-hands-in-the-air-like-you-just-don’t-care type of thing – who knows what it will be like, or what it will grow into, but (to bring it back to a discussion about architecture) I’m hoping that within 5 years we’ll see every architect on site carrying one with ALL the drawings loaded on, the foreman on site with his own slate bearing the same version of your documentation as you do, every student in Uni with ALL their notes in the one device, newspapers made of paper will have largely disappeared (well, that’s happening anyway) to be replaced by these simple flat screens, all the eBooks in the Library replaced by your one slick machine, and all the bulky computers at home cluttering up desks gone and replaced by a simple slate tablet. I’ll go on holiday with one slate instead of a box of books, and they’ll read their slate on the Tube on the way to work instead of that silly folding the paper up to a column at a time thing they do now. Kindle will be dead and gone (and it hasn’t even got here yet – too late Jeff Bezos!). Who knows really? What will they launch? What will happen after? We’ll see what happens. There’s a week to go. And if you haven’t been reading the tech blogs, then remember – you read it here first. And now, just for posterity, and later general possible hilarity, here is a brief snippet of what the web has been saying about the possibility of an Apple Tablet, possibly called the iSlate. And sorry about this last one, if you’ve got this far. Some people just ‘guess’ too much to be outsiders. Does this guy know something that others don’t? We’ll find out in a week’s time…. Sactoguy18: “1) We will have not one, but TWO different tablet computers, one with a 7″ screen and one with a 10.1” screen. Both screens will be LED backlit (for now) to keep power consumption reasonably low. 2) The 7″ version will offer 64 GB of flash memory, while the 10.1″ version will offer 128 GB of flash memory. Mind you, if the next-generation flash memory is available by the time the tablet computers reach retailers in April 2010, we could get 128 GB for the 7″ version and 256 GB or the 10″ version. 3) The touchscreen could sport some soft of haptic touch feel–though the technology used is still unknown. 4) It will use improved versions of the CortexA8 ARM CPU and PowerVR GPU, using PA Semi technology that Apple owns because Apple bought out PA Semi. These improvements will speed up performance and allow for flawless playback of HD video downloaded through iTunes (720p plus full interactive LP liner notes). 5) It will run a new, “intermediate” MacOS X version that is more functional than the iPhone OS but less functional than MacOS X 10.6.2 found on real Mac computers. This new MacOS X variant allows for true multitasking and cut-and-paste, and will use an interface designed specifically for touchscreen functionality. 6) Will include 802.11b/g/n Wi-Fi wireless network connectivity as standard, with optional GSM 3G HSDPA/HSUPA / CDMA 3G EVDO multi-standard cellular network connectivity (probably using a Broadcom chipset). 7) External connectors will include iPod dock connector (for charging and syncing through USB 2.0 port) and Mini DisplayPort connector (with optional Mini DisplayPort to HDMI 1.3) adapter. Pricing will be US$549 for 7″ version, US$749 for 10.1″ version. but already there are comments on the possible naming… the iSlate, the iTab, the iPad, etc. Did they do the iBeam too? only 8 hours to go. Its going to be big – its going to be such a huge change – I’m hoping. Don’t you wish you had bought some Apple shares now? Damn! “There’s much to like, of course. The physical beauty and classy build quality, as in anything designed by Jonathan Ive. The shockingly low price � $499 for the basic model. The contract-free, unlocked nature of the 3G version. But there are two chief reasons for its guaranteed success. 1. It is so simple. It is basically a highly responsive capacitative piece of glass with solid-state memory and an IPS display. Just as a book is basically paper bound together in a portable form factor. The simplicity is what allows everyone, us, software developers, content providers and accessory manufacturers to pour themselves into it, to remake it according to the limits of their imagination. I’ll stop before I get too Disney. 2. It is made by Apple. I’m not being cute here. If it was made by Hewlett Packard, they wouldn’t have global control over the OS or the online retail outlets. If it was made by Google, they would have tendered out the hardware manufacture to HTC. Apple � and it is one of the reasons some people distrust or dislike them � control it all. They’ve designed the silicon, the A4 chip that runs it all, they’ve designed the batteries, they’ve overseen every detail of the commercial, technological, design and software elements. No other company on earth does that. And being Apple it hasn’t been released without (you can be sure) Steve Jobs being wholly convinced that it was ready. “Not good enough, start again. Not good enough. Not good enough. Not good enough.” How many other CEOs say that until their employees want to murder them? That’s the difference.